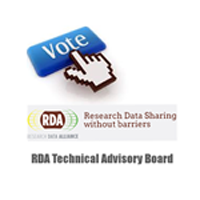 They are the new members of the RDA Technical Advisory Board (TAB). The full election results are shown below. There were six open positions. The top six vote getters win subject to the balance requirements described in the TAB Process Document. These require at least two people from each region and no more than five people from each region, discipline, and role (see categories below). One interim position remains open. This will be appointed by Council. Thank you to all the excellent candidates. 4A 3E 2AUS || 2ET 4NS 3HUM MED || 2 DM 5DT 1DG 1DP <-- HERE WE HIT 5 DT, so no more DT. 4A 5E 2AUS || 3ET 5NS 3HUM MED || 3 DM 5DT 2DG 1DP AND DONE. 6 new members.